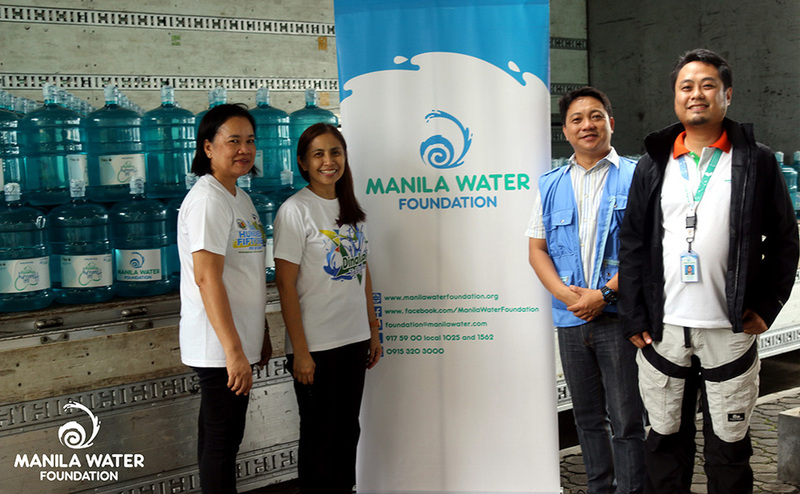 MWF Executive Director Carla May Beriña-Kim (leftmost) led the turnover of 5,000 gallons of drinking water for the affected residents of Pulilan, Bulacan. Joining her in the turnover (from left to right) are Pulilan, Bulacan members of the local government unit headed by Mayor Maritz Ochoa-Montejo along with Vice Mayor Ricardo Candido, Councilor Reynaldo Clemente, Jr., MWF Program Manager for Water Supply Xavier Cruz, Municipal Administrator Vicenta Santos and Operation and Maintenance Office Head Maria Concepcion Imbing. During the onslaught of the Southwest Monsoon (Habagat) rains, Manila Water Foundation (MWF), through its Agapay Para Sa Barangay (APSB) program, deployed 43,000 gallons of water to different provinces in North and Central Luzon to aid in providing safe and potable drinking water to more than 8,600 affected families. Beneficiaries of the water bottles are residents of areas heavily hit by the monsoon rains in Bataan, Pampanga, Bulacan, and Pangasinan. Among them is Ben Paule who lives in an Aeta community in Brgy. Tubo-Tubo, Dinalupihan, Bataan. He shared that he feared for his three grandchildren who were left under his care when their mother passed away due to a blood infection. 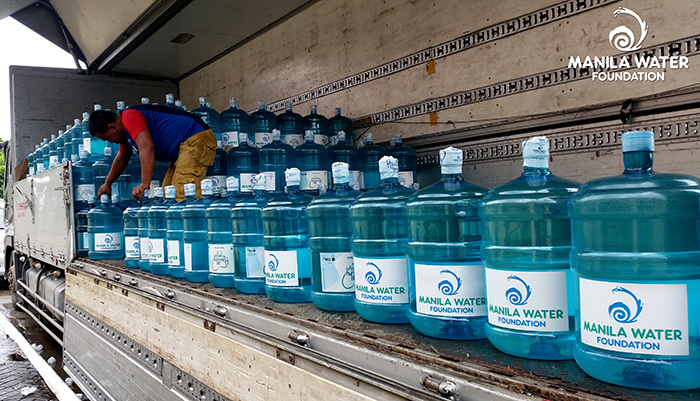 MWF distributed 43,000 gallons of water and 100 solar bags to Habagat affected areas in North and Central Luzon for the benefit of 8,600 families. “Magmula nung bumagsak ang ulan na ito, kami po ay di na masyadong malaya. Kasi sa lakas ng ulan, iniisip po namin baka matibagan kami. Kaya po kami nagpipirmi sa bahay namin o sa barangay [hall], naghihintay, nakikiramdam sa TV at sa radyo.Kami dito sa Brgy. Tubo-Tubo ay nagpapasalamat at kami po ay nabigyan ng tubig na galing sa Manila Water Foundation. Malaking tulong po sa amin lalong-lalo na sa amin na minsan nakakainom ng malabong tubig,” (Since the rain started pouring in our barangay, we cannot move around or go outside. We fear that a landslide might happen anytime, thus we just stayed inside our houses for safety and often went to the barangay hall to hear news about the current situation. The residents of Brgy. Tubo-Tubo are very thankful because we were given clean drinking water by Manila Water Foundation. This is a big help for us especially that the quality of water we drink is often questionable) Ben shared. Ben Paule, an elder of an Aeta community in Dinalupihan, Bataan, was one of the beneficiaries of the MWF’s disaster response. 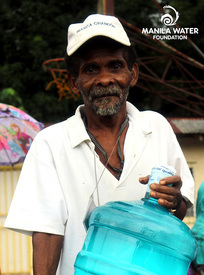 The water he received will help him and his three grandchildren who became orphans at a young age. Other beneficiaries from nearby municipalities also expressed their gratitude for the help that they have received from MWF. Merlita Arga, an evacuee in Dagupan City, Pangasinan shared her experience and how having safe drinking water will help her family get through their days in the evacuation center. “Limang araw na kami dito [sa evacuation center]. Umabot na yung baha sa bahay [namin]. Lagpas tao [na]. Pinakamalalim doon sa amin sa [Sitio] Fisheries. Wala na rin po kaming maiinom na tubig. Maraming maraming salamat po dahil tinulungan po ninyo kami. [Ngayon,] makakainom na po kami,” (We’ve been in the evacuation center for five days now. The flood already reached our houses in Sitio Fisheries. We also have no water to drink. Thank you very much for your help. Now, we have safe water to drink) she quipped. 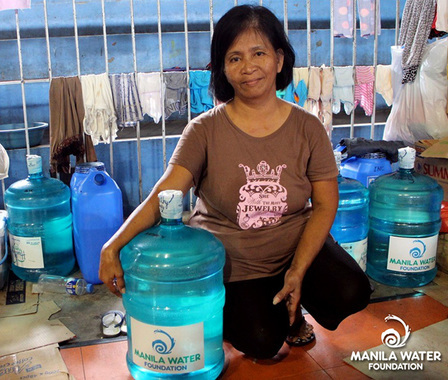 Merlita Arga, one of the evacuees ffrom Sitio Fisheries, Malued, Dagupan City, Pangasinan who already spent five days in the evacuation center, expressed her gratitude upon receiving safe drinking water from MWF. Aside from residents who directly benefited from the donation, local leaders of different municipalities also expressed their appreciation on behalf of their constituents. Dinalupihan, Bataan Mayor Gila Garcia said that they are very grateful for the good gesture that MWF has extended. She also reiterated the importance of having a clean water source in her jurisdiction especially since a large portion of their population still doesn’t have direct access to piped water. “Talagang we saw na you were here right away. You called even before we asked. We really need to address the issue on safe and potable water for all our households. So we are hoping that somehow, considering all the situations that are already given, that we will have an opportunity to work together with Manila Water Foundation and Manila Water Company,” she said. MWF carefully coordinated with local government units before and during the deployment of the relief operation. 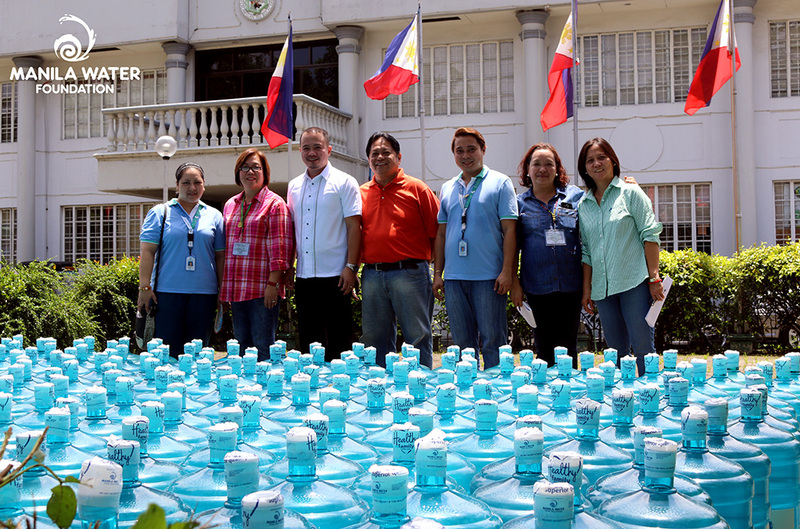 Photo shows (from left to right) Dinalupihan, Bataan Municipal Social Welfare and Development Office Head Ofelia Mendoza and Mayor Gila Garcia receiving the 7,500 gallons of drinking water from Manila Water Company New Business Development Project Manager Joey Sampang and MWF Program Officer Rod Reyes. Pulilan, Bulacan Mayor Maritz Ochoa-Montejo lauded the APSB program and encouraged MWF to continue its mission of providing safe and potable water to disaster-affected communities. “Napakarami na po nang nabaha dito sa amin kaya ang tulong ninyo na clean, safe, and potable water ay napakagandang proyekto. Sana ay di kayo magsawa sa pagtulong,” (Many residents here in Pulilan were affected by the floods brought about by the rains. Your initiative to bring safe and potable water to communities like ours is very helpful. I wish that you would continue with such projects) she expressed with glee. Aside from the water bottles, 100 solar bags were also given to serve as portable water treatment apparatuses in Calasiao, Pangasinan. Part of the funding for the distributed items was taken from a special block screening organized by MWF back in June.